Jeanne Assam: The Forgotten Woman Who Stopped a Church Shooting-Truth! - Truth or Fiction? Jeanne Assam: The Forgotten Woman Who Stopped a Church Shooting-Truth! A woman named Jeanne Assam used a legally concealed gun to turn away a deranged gunman who stormed her church and began shooting people. 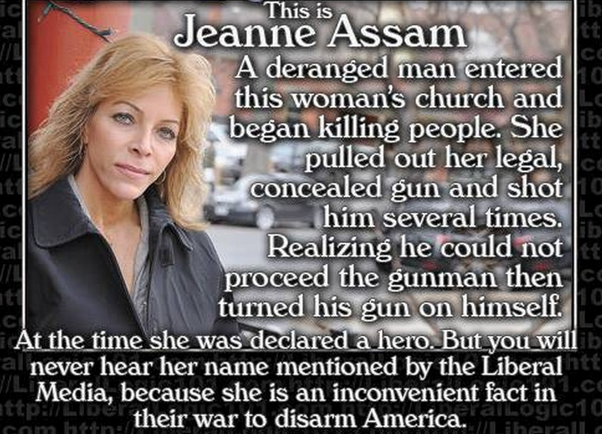 The tale of a Jean Assam using a legally concealed gun to stop a church shooter is true. 24-year-old Matthew Murray killed two teenaged sisters in the shooting, and a number of parishioners were injured. However, police said without Jeanne Assam’s fast action, the damage would have been much worse. Matthew Murray, who professed hatred for Christianity in a number of online posts, had killed two missionaries at a training center in Arvada, Colorado, the day before the shooting at the New Life Church, the Colorado Springs Gazette reports. In a strange twist, Jeanne Assam said in 2011 that she was asked to leave the New Life Church after she came out as gay. Church officials denied that and said all were welcome at the church. The story of Jeanne Assam resurfaced in June 2015 after a self-described white supremacist killed nine people during bible study at African Methodist Episcopal Church in Charleston, South Carolina. A social media post inferred that the shooter could have been stopped by an armed victim, like Jeanne Assam had done years earlier. The post also said that Assam’s story had been ignored because it was “inconvenient” for mainstream media outlets’ hidden gun control agenda. So, is it true that armed civilians who regularly stop mass shooters are ignored mainstream media? Data indicates that the answer is “no.” Armed civilians have stopped just 1.6% of mass shootings, so it’s very rare. Still, the story of Jeanne Assam is true. Dinosaur Egg Hatches at Museum in Berlin-Fiction!